Mon., Dec. 7, 2015, 8:42 p.m. 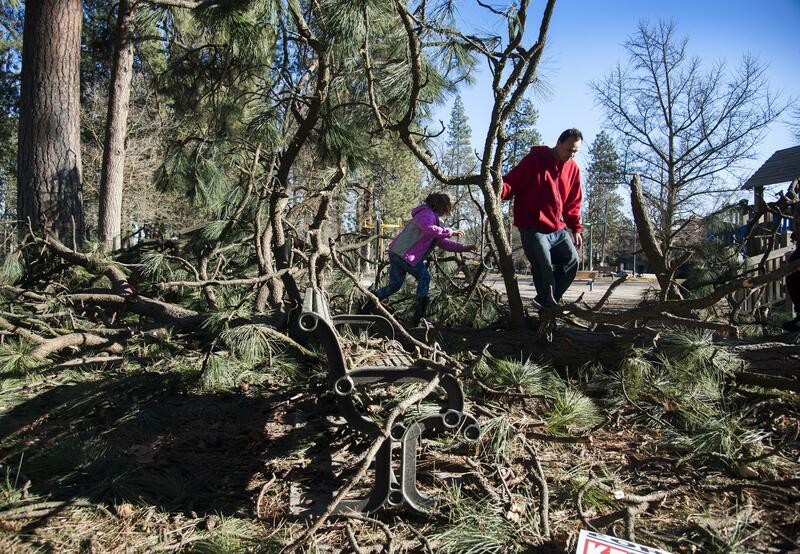 The City of Spokane collected 3,000 tons of windstorm-related debris. During the 18-day-period it was free to dispose of tree and yard waste at the Waste-to-Energy Plant and the Northside Landfill. There were nearly 8,000 visits. The busiest day was Saturday, Nov. 21, when more than 400 tons were deposited, according to a city news release. Free disposal at those two sites has ended, however, some residents will have another opportunity to dispose of debris without charge. Residents of City Council District 2, which covers south Spokane, can take yard and tree waste to Ferris High School Dec. 12 and 13 from 9 a.m. to 1 p.m. Residents of City Council District 3, which covers northwest Spokane, can take yard material to Dwight Merkel Park Dec. 19 and 20 from 9 a.m. to 1 p.m.
An event for residents of District 1 was held last weekend. Only branches smaller than 3 inches in diameter will be accepted. Correction: A previous version of this story posted incorrect dates for the Dwight Merkel Park pickup. The correct dates are Dec. 19 and 20. Published: Dec. 7, 2015, 8:42 p.m.